Here’s the thing about 19th-century novels: pleasurable though they may be, eventually you find yourself feeling strangled by the misogyny. After growing increasingly dissatisfied with roles for women in “Far From the Madding Crowd” (1998), “Our Mutual Friend” (1998), and the full 882 pages of David Copperfield, my fixation finally bottomed out late last night with the horrifyingly bad 1997 American TV-movie version of Louisa May Alcott’s “The Inheritance” — a show so embarrassing I held my head in my hands (but I watched every minute of it, just in case). 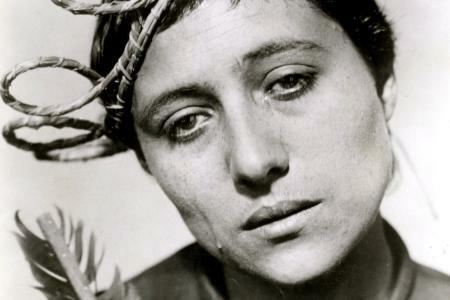 So I turned tonight to the 1928 “Passion of Joan of Arc,” a French silent by the Danish director Carl Theodor Dreyer, starring the stunningly beatific Melle Falconetti — who looks like James Spader did in his beautiful youthful days, with that broad face, wide blue eyes, and perfect lips. Except whereas Spader used his beauty so often in those years to evoke cruelty, Falconetti sheds tears of love for God. There’s another reason to geek out with this film during my summer of research: it opens with a shot of someone thumbing through pages of the original testimony of Joan’s trial as it was recorded in 1435; the film covers her trial alone (and takes significant liberties with the facts, though for good effect) — so it ends up being a surprisingly textual film for archives geeks out there. The down side of this choice is that we see all of Joan’s suffering and none of her muscular Christianity and military leadership. So while it’s not surprising that the film can be found streaming on the website Gloria.tv (its catchphrase is “The more Catholic, the better”), it’s unsurprising to learn that it was originally censored by the Church for its portrayal of the hypocritical, corrupt leaders that oversaw Joan’s trial. With her hair clipped so close, Falconetti has an unapologetically androgynous face; devoid of any perceivable makeup and appearing to shed real tears, the 35-year-old actor holds virtually every scene as she plays the 19-year-old martyr. I can’t remember seeing a film in which the tight close-up of its protagonist constitutes so much of the film’s narrative. (There’s even a scene in which the priests bleed her and real blood comes spurting out of an arm, but I find via online commentary that this was the arm of an extra.) Every shade of emotion crosses her face — pure devotional love, sudden fear that she may have been fooled by the Devil, misplaced trust in a sneaky priest, religious conviction. It’s stunning that this was her second of only two films; she dedicated the rest of her career to the stage. This kind of role in such an otherwise spare film — the sets are bare bones, and there are only a few exterior scenes with crowds of angry followers — must have been brutal to get right. When the film isn’t asking us to gaze at her, it engages in a lovely bit of cinematic elegance: it gazes upward. Sometimes toward the sky or birds lofting onto a church spire, sometimes toward a window placed high on a wall, sometimes merely toward the shadow of a window on a blank white wall with its cross-like panes. Each time, these scenes infuse the film with religious hopefulness, even as the priests’ perfidy becomes glaring and Joan’s fate becomes ever more doomed to the stake. I’ve got virtually no religious bones in my body, but seeing this film took me back to my weird middle-school years, when I yearned for faith (to fit in, to ease my fears of death, to find meaning in junior high…). If I’d seen this then I would have tried to be Joan — to experience her clear-eyed certainty (and even more important, to model those beautiful expressions on her face). Thus, I watched this film with a tangle of memories, as well as more academic thoughts about women’s long history in the church and the power of devotion to give one a life beyond wife-dom, ceaseless childbearing, and drudgery. No wonder nuns continue to have such appeal to young girls, even now — with cinematic models such as Falconetti, Deborah Kerr, Audrey Hepburn, Jennifer Jones, and even (argh) Julie Andrews, womanhood as a religious devotee allows women an exceptionally meaningful life that doesn’t require having good hair or enough money for a dowry. 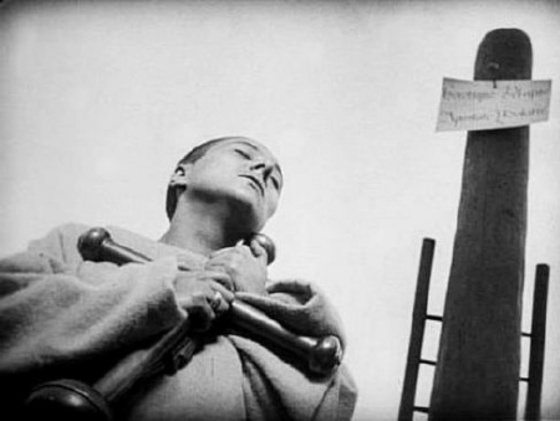 I see that a group of film bloggers recently declared “The Passion of Joan of Arc” the best silent film ever. I’m not sure I’m ready to go that far, but it’s worth reading about the extraordinary story of its destruction, censorship, reconstruction, and the eventual rediscovery of what they believe to be the original print. It’s not exactly the kind of antidote to 19th-century feminine mawkishness I was expecting, but Joan of Arc’s passion is a head-clearing dose nevertheless. Beautiful.